Today was one of those dreary Adirondack days. Yes, I admit, we have them here in paradise. It is November in the Northeastern United States; gray and dreary is not uncommon. Although I aspire to find something good or pretty about all kinds of Adirondack weather, 33 degrees, overcast, and damp gets old quickly. The bottom line for me and cold is: if there is no snow on the ground, or falling from the ski, ooops, sky, why have cold? Driving from my place into and around the Village of Lake Placid on a dreary day can sometimes boost my spirits since I get to see all the mountain tops coated with snow, so I gave myself a few extra minutes during today's errands. 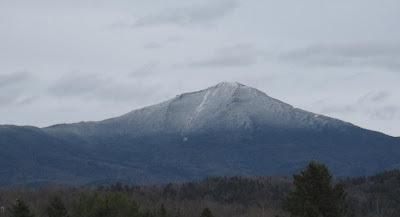 As you can see in today's featured photo of Whiteface in the Adirondacks, looking dream-like on account of that frosting (all due respect to Sweet Baby James), it only takes a moment to make the day.